I’m assuming that you’ve used a calculator or some other means to workout your daily calorie and macronutrient goals. If you are eating clean, taking in 1500-2000 calories a day and doing intense exercise, this kind of meal is right up your alley. This recipe can be altered to fit your needs. Too many grams of carbs? Switch out the rice and quinoa (47 carbs) for green veggies (I’d suggest broccoli or spinach). Too many calories over all? 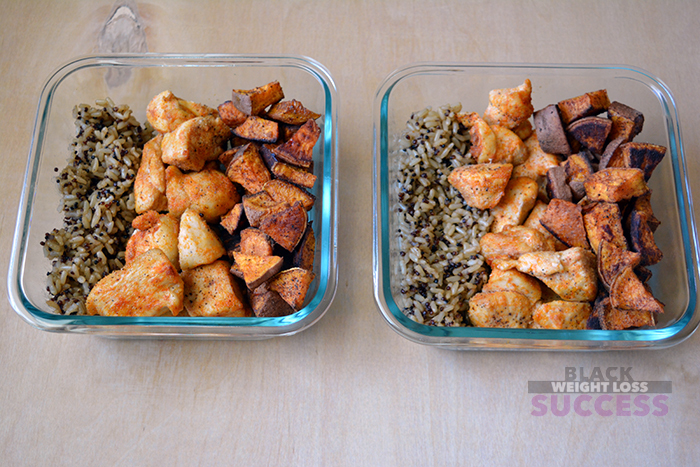 Just have chicken and one of the carbs (sweet potato or rice/quinoa). You can also adjust the serving sizes. Cut up chicken breast into chunks and place in a bowl. Add 1 tablespoon of olive oil and hand mix to coat. Add garlic powder, onion powder, salt and paprika, and mix by hand to coat the chicken with spices. 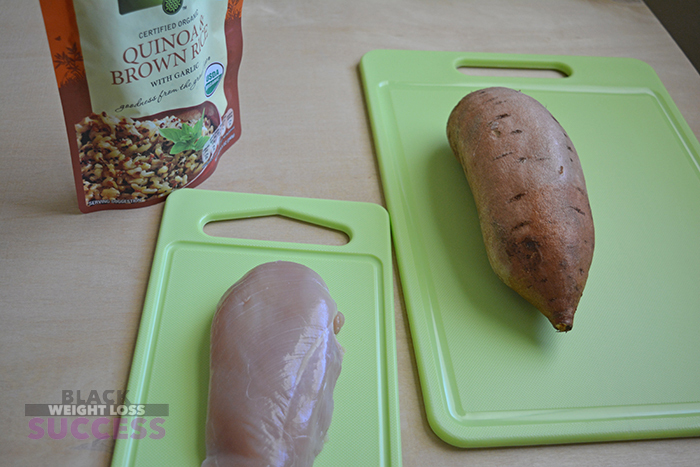 Place the bowl in the fridge while you prep the sweet potato. 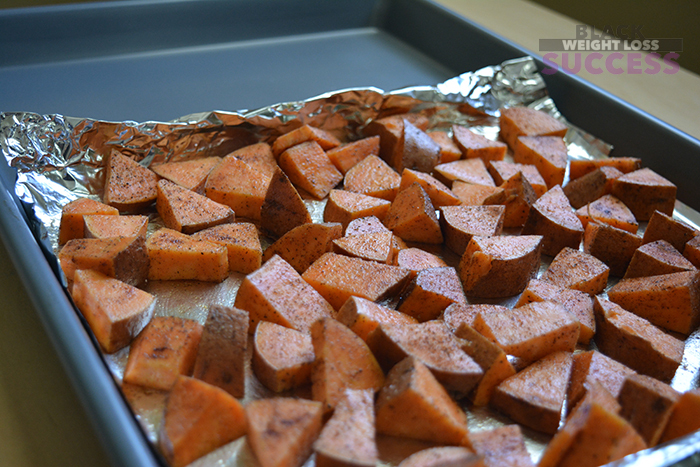 Cut the sweet potato (skin on) into chunks (1/3 to 1/2 inch wide). Place in a bowl and drizzle on 1 tablespoon of olive oil. Toss to coat. Drizzen 1/2 tablespoon of olive oil on the larger section you’ve mapped out on the baking sheet. Add the sweet potato chunks. Sprinkle on the cinnamon, nutmeg and pepper and toss to coat. Cook for 20 minutes and remove. 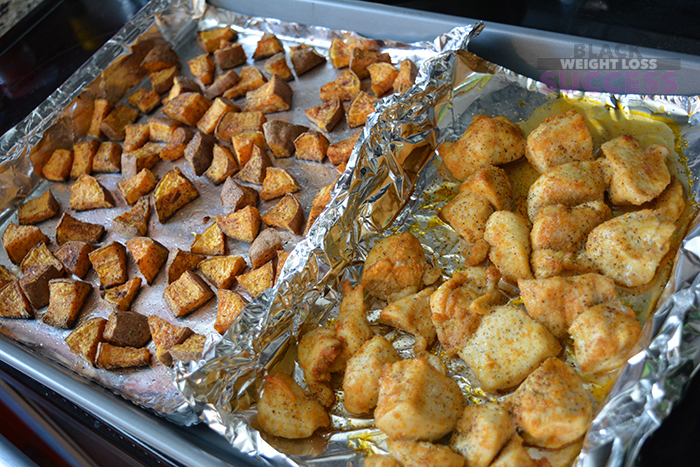 Remove the chicken from the fridge and place it on empty section of the baking sheet. Sprinkle on black pepper to taste. Bake for 15 minutes. 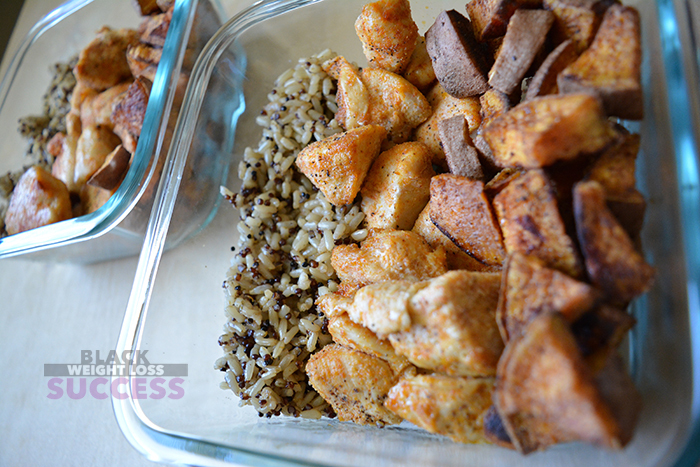 Check to see if the sweet potatoes and chicken are throughly cooked. If not, cook for 3-5 more minutes or until done. Cook the rice and quinoa mix by following the instructions on the package. Why should you consider preparing meals in advance? Deciding in advance what you will eat each day can help ward off cravings and overeating. Meal prepping also allows you to analyze exactly what you plan to eat in terms of calories, carbs, sodium, protein, fat, fiber, etc. One of the things I’ve heard over and over about meal prep is, “I don’t want to eat the same thing for 7 days.” Well, you don’t have to. You can prep just 1 or 2 days in advance if you like. Two to three days of meal prep for one meal of the day (breakfast, lunch or dinner) is a perfect way to start for anyone who wants to try meal prepping. Meal prep can be intimidating, but it doesn’t have to be. Use familiar recipes and cook healthy food that you love. You’ll find lots of meal prep friendly recipes online on sites like Pinterest. Give it a try. Start with this simple meal prep recipe. Looks good. Keep them coming. Thank you for all you do with this site. It is truly appreciated. I have made this twice. Oit is so tasty.